Triangle Collision is a high quality collision repair center serving the Cary, NC area. We understand how stressful getting into an accident can be. That’s why we provide a hassle free experience – handling your claim and repairing your vehicle back to pre-accident condition. Our factory-trained technicians are equipped with the tools and equipment to fully restore your vehicle. We’ll keep you moving with 24/7 towing and can arrange for a ride home or a car rental if you need it. Lifetime Warranty On Repairs and Paint! We stand behind our collision repair with Lifetime Warranties for many of our services. Our highly educated technicians follow the factories guidelines for repairing your vehicle. This way the job is done right and your vehicle is driving just as it was before the collision. We are dedicated to being a trustworthy collision repair center. We are honest with our customers, and provide full post-repair inspections so you understand the full extent of the collision damage. Some shops might cut corners to save money or to appease the insurance company. However Triangle Collision values a complete and high quality repair. Our highly trained technicians follow factory guidelines when performing collision repair. This way we know that your vehicle has been put together the way the manufacturer intended. There is no one-size-fits-all repair for modern vehicles and we approach each repair as a unique case. It’s your choice, not the insurance companies, where your vehicle is repaired. Choose Triangle Collision, the Cary, NC area’s premiere collision repair shop. Our technicians have received extensive training in modern collision repair. The unique and complex components of new vehicles require specialized knowledge in order to repair properly. OEM parts are guaranteed to fit into your vehicle when parts need to be replaced. By following the guidelines set by the factory, our technicians will be able to return your vehicle to pre-accident condition (if not better). Your vehicle’s safety features have been meticulously designed by the manufacturer. Cars today are capable of enduring severe accidents while keeping the passengers safe. This is because of the complex systems built into the vehicle that are designed to react in very specific ways during an impact. Your airbag is constructed to go off at just the right moment to protect you. However a bad repair could cause your airbag to deploy at the wrong time, and the consequences could be fatal. Your safety is our number one priority at Triangle Collision, which is why we use OEM parts and strictly follow factory guidelines for collision repair. This is the only way to ensure that the safety features built to protect you are maintained after your vehicle is repaired. Often times the insurance company will try to get a collision repair center to cut corners in order to save money. 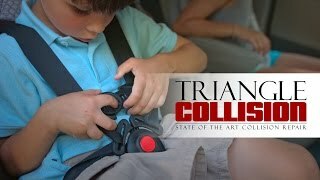 Triangle Collision is dedicated to delivering only high quality and factory-approved repairs for our customers. We understand how to handle your claim so that your vehicle is driving properly and safely after our collision repairs. You have a right to choose where you take your vehicle after a collision. Bring it to us, where you know you can receive trustworthy collision repairs. Insurance claims are stressful, and can be confusing. We work with all major insurance providers to make sure that your vehicle receives a full repair. Where you take your vehicle after a collision is your choice, not your insurance companies. With Triangle Collision you know that you have a trustworthy auto body shop to turn to. We use BASF refinishing technologies onsite so that you can get your vehicle looking new without having to take it to a different location. BASF is the industry standard for paint and refinishing technology. We will be able to perfectly match the color of your vehicle’s original paint. We are partnered with Lemon’s Wrecker Service in order to provide our customers with convenient 24/7 towing. The cost is wrapped up with the total of your collision repair in order to more easily cover it in the insurance claim. We understand that you need to keep moving, even after a collision. We can find a way to get you back on the road if your vehicle is due for an extended stay. Whether it is a rental car, or a ride home.